He added that President Mahmoud Abbas will participate in the canonization celebrations in Rome May 17. “We are having a very big celebration now. 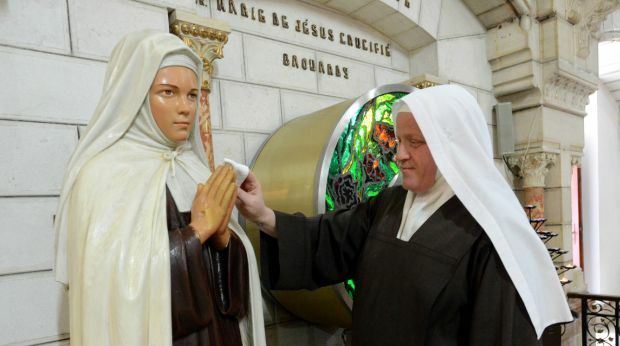 Especially now that we are living a very difficult time in the Middle East, to have two Palestinian saints is wonderful,” said Sister Ferial of the Infant Jesus, a member of the Carmelite convent that Mariam Baouardy, Blessed Mary of Jesus Crucified, founded in Bethlehem. Thirteen sisters are members of the cloistered convent, with Sister Ferial the only Palestinian among them. Having joined the order four years ago after renouncing her previous life as a store owner and physiotherapist, she is also the only exterior member who serves as a connection between the sisters and the outside world. Blessed Marie-Alphonsine, born Soultaneh Maria Ghattas was born in Jerusalem in 1843 and is the founder of the Dominican Sisters of the Holy Rosary of Jerusalem, the first and still the only Palestinian women’s religious congregation. The Rosary Sisters are well-known in the Holy Land and the Middle East for their numerous educational institutions and were the first to open schools for girls in the villages visited by Mother Marie-Alphonsine, as she is known. They are particularly well-loved by local Catholics for their close connection and understanding of the local people, their traditions and language. Mariam Baouardy, a Melkite Catholic, was born in 1846 in the Galilee village of Ibillin and died in 1878 in Bethlehem after having traveled to Egypt, France and India. She founded a Carmelite convent in India and one in Nazareth. Also known as the Little Arab, or the flower of Galilee, she was granted a series of gifts such as ecstasy, levitation, the stigmata, transverberation of the heart and the gift of poetry. At an April 18 ceremony in Ibillin consecrating St. Mary of Jesus Crucified Chapel, commissioned by the Melkite Catholic Church, Latin Patriarch Fouad Twal noted the importance of the two women in the formation of two religious orders in the Holy Land. Mother Iness Al-Yacoub, superior general of the Rosary Sisters, said the canonization was a “big grace and blessing from God” for her congregation. Mother Marie-Alphonsine is credited with saving at least two girls from drowning, one in 1885 in the city of Jaffa, and another, Natalie Zananiri, a former student of the Rosary Sisters high school in Jerusalem’s Beit Hanina neighborhood. She was among five girls rescued from a collapsed septic tank 12 years ago. The girl’s mother had prayed to Mother Marie-Alphonsine earlier in the morning on a premonition, asking her to protect her daughter, and the rescue was credited to the late nun’s intercession. Her rescue paved the way for Mother Marie-Alphonsine’s beatification in 2009. Blessed Mary was beatified in 1983. Rimond Hayek, 58, a Catholic from the Galilee village of Deir Hanna, recently visited the Carmelite convent, where the nun’s relics are kept. In this articul is mistake in two places: He added that President Mahmoud Abbas will participate in the canonization celebrations in Rome May 23. and in foto:Blessed Mary is one of two Palestinian nuns who will be canonized by Pope Francis during a May 23 ceremony in Rome. (CNS photo/Debbie Hill), becouse ceremony in May will be 17 – iknow, Iwill be in Roma.